SHANE STARTZEL – Brass Caption Head; JOE WILT – Assistant Brass Caption Head; RACHEL EWANIUK, MARK HOVER, AND CONNOR BARZ – Brass Technicians; and DOREEN SANDOR – Brass Technician/Brass Assistant to the Caption Head. This is Shane Startzel’s second year as Skyliners’ Brass Caption Head. At Shikellamy High School he was Brass and Visual Tech in 2001, and Brass and Visual Caption Head from 2002-2003. Shane worked with the Victor High School Indoor Percussion Program (VIPE) from 2007 to 2011, was Visual Tech in 2007, and has been The Victor Marching Blue Devils’ Brass Music Instructor from 2008 to present. He marched with The Bluecoats (DCI) in 1991 and 1992, and the Empire Statesman (DCA) from 2003 to 2007. Joe Wilt is the second generation of a drum corps family, and began his drum corps career at age 6. He will be returning to the Skyliners in 2017 for his second year as Assistant Brass Caption Head. Since 2010 he has been Brass Coordinator for the Webster High School Marching Band (NY). Joe currently plays professionally with Prime Time Brass, and previously with Corps Impact (San Francisco, CA), BD Entertainment (Concord, CA), and The Edge (Rochester, NY). Joe’s DCA experience includes various performing, instructional, and leadership roles in the Empire Statesmen from 2009 to 2013, and the San Francisco Renegades from 1997 to 2008. He was also Founder and Co-Director of the SF Renegades Minicorps, winning the 2001 and 2003 DCA Championships. Rachel Ewaniuk has been on the Brass Staff of the Skyliners and marched Lead Soprano in 2015 and 2016. She marched with the Spirit & Pride of Pennsylvania Marching Band at Mansfield University where she received a Bachelors Degree in Music Education and Music Technology. A featured soloist in senior year, Rachel was a member of the elite Concert Wind Ensemble, Orchestra, Brass Band, Symphonic band, Jazz Lab Band and Trombone Choir. Rachel marched lead Trumpet with the Bushwackers Drum & Bugle Corps. Presently a 4th to 6th Grade Band Director at the Lehigh Valley Academy in Bethlehem, Pennsylvania, Rachel also teaches private instrumental lessons. Mark Hover received a Bachelors of Music degree from SUNY Fredonia (trumpet performance and Education) and a Masters of Music degree from Boston University (Music Education). A teacher in the North Syracuse Central Schools since 2006, Mark is a Middle School band director. His experience includes marching band and indoor drum line in high school, playing Mellophone and Soprano with the Syracuse Brigadiers Drum & Bugle Corps from 1997 to 2000 and the Empire Statesmen from 2011 to 2013. Mark is Assistant Director of the Cicero North Syracuse Northstars Marching Band and Co-director of Northstars Indoor marching ensemble. A New York Skyliner Lifetime Member, Doreen Sandor has been on Sky’s brass staff in the 1980s, 2000s and 2010s as in-line tech, Brass Instructor, 2005 Brass Caption Head and Assistant Caption Head. Doreen played Mellophone, French Horn, and Soprano with Skyliners, and played Mellophone in Sky’s 2007 Mini-Corps and the 2011 and 2012 Alumni Corps. She has been Brass Caption Head, arranger and instructor for corps in DCA, DCI, Garden State, Nassau-Suffolk, British Youth Band Association (BYBA) and DCUK. She was on Kidsgrove Scouts’ U.S. staff in 2012 and 2015. Doreen teaches Music in upstate New York. Connor Barz is Band Director at Northampton Area Middle School (PA) teaching Concert, Marching, and Jazz band. He was Visual Caption Head for Northampton Big ‘N’ Band for two years, played Mellophone in the Northampton Big ‘N’ Marching Band from 2007 to 2009, and was Drum Major in 2010. He played Mellophone in the WCU Marching Band from 2011 to 2013, two years as section leader. Connor performed with the WCU Wind Ensemble for seven semesters. 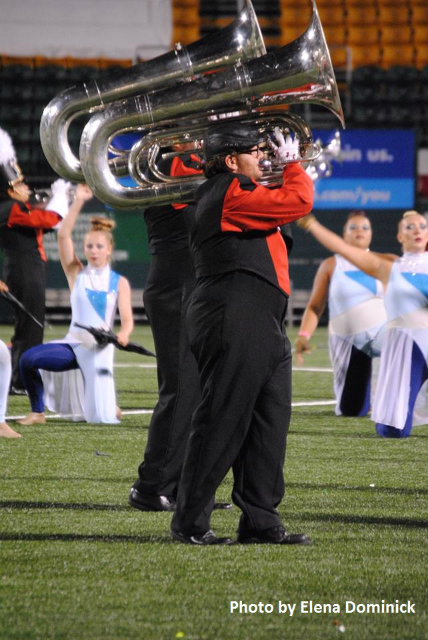 He marched with the Reading Buccaneers Drum and Bugle Corps – 2013 on Mellophone and 2014 on Baritone, and played in the Front Ensemble at Aftermath Indoor Percussion for one season. Details about The Skyliners’ 2017 Open House will be announced shortly. Keep up-to-date with us via the Skyliners Drum & Bugle Corps Website and join the Skyliners 2017 Interest Page at Skyliners 2017 Interest Facebook Page. For more information, please contact Larry Carbonell, Director director [at] marchsky [dot] org or go to Skyliners 2017 Join Page. Posted by News Editor on Monday, October 10th, 2016. Filed under DCA News, FrontPage Feature.